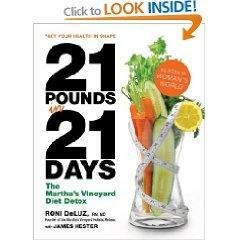 21 Pounds in 21 Days is a book written by Roni DeLuz, a registered nurse and naturopathic doctor who explains the details of the Martha's Vineyard Diet Detox and how it rids the body of toxins. What Is the Dolce Diet? 32 oz. of either a green drink made from vegetables, vegetable juice, or a berry drink. All of this liquid adds up to about 1,000 calories with approximately 20 grams of protein per day. According to the author, "Rest comes from not chewing and ingesting nutrients in liquid form. Eliminating toxins, resting the body and engaging in elimination therapy, you cleanse and rebuild the body so it can shed weight." And while it isn't meant to be a weight loss diet, the very nature of detoxification aids the body in shedding unwanted weight in the process. Following a liquid detox diet is not easy, but this plan offers three different choices designed for different purposes. Basically, these three plans are really one and follow the same regimen of drinking every two hours. The author suggests that the 21 day plan be followed once a year while the seven day plan should be initiated as a "cleanup" each season four times a year. The two day plan is recommended as a weekly cleanse to be followed as a weekend detox. Most of the toxins in our bodies are stored in our body fat. Cleansing is believed to metabolize the fat which forces the toxins into the blood stream. Once that is accomplished the body takes care of the rest by processing the toxins to be eliminated. However, contrary to what you might think, this elimination process is not entirely done through the urinary tract or bowel. Another major organ which aids in the elimination of toxins is the lungs as toxins are expelled in our breath.Often people hear about detoxifying without really understanding the scope of toxins stored throughout their bodies. The thinking behind this and many detox plans is that when people follow a traditional diet plan to lose weight their bodies do not metabolize or eliminate properly. On the other side, a detox diet composed of natural nutrition not only promotes better health and helps to lose unwanted weight but also gets rid of the toxins which contribute to weight gain and poor health. Once your system gets accustomed to processing food again, more nutritious foods can be added, but know ahead of time that no coffee or alcohol is allowed on this diet and even after the maintenance stage is reached they are to be strictly limited. Also, if you're thinking of trying this diet, be prepared to stay home for your meals because going out is just about impossible unless you bring your liquid meal with you. If you know all this, and have the okay from your doctor, then you can purchase a 21-day program plus nine-day maintenance pack for $199 through the author online.